Want more than the standard cruise ship / beach resort view of the Caribbean? 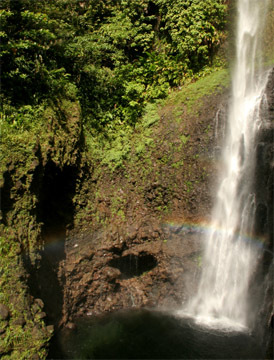 Go to Dominica to cool off in pristine waterfalls and explore jungle trails that few tourists find. IF YOU THOUGHT THE Caribbean was all about cruise ship and cocktails, think again. Dominica is mountainous. Countless jungle trails lead to waterfalls and steaming hot springs. Don’t expect to lounge in a beach chair; Dominica is all about exploring, getting dirty and embracing romantic discovery. The Commonwealth of Dominica lies in the middle of the Lesser Antilles, with Guadeloupe to the north and Martinique to the south. Roseau, the capital, is on the southwestern side, facing the Caribbean. Getting to Dominica can take some planning. There are two airports on the island, Canefield near Roseau and Melville Hall on the northeastern side, but flights can be expensive. Neighboring islands Martinique and Guadeloupe are better hubs for connecting flights to North America and Europe. From there you can take a ferry through L’Express des Iles, which will take you to the Port of Roseau. Dominica uses the Eastern Caribbean Dollar (XCD). Many places accept US dollars, but this can lead to confusion and paying more than you need to. In Roseau there are several ATMs which make getting cash easy. If you stay in a small guesthouse, plan to budget about $30-60 USD per night for a double. Eco-lodges and resorts run a little more expensive and can range anywhere from $50-$250 per night for a double. Life on Dominica is relaxed; stress isn’t part of the local vocabulary. To take advantage of this ambiance, stay in a local guesthouse. Despite a small population, people all over the island open up their houses and beds to tourists. You can expect a genuine morning “how are you” and breakfast, complete with a glass of passion fruit or sorrel juice. In Roseau, your best bets are Ma Bass Guest House and St. James Guest House. For a more romantic getaway, nothing compares with one of the eco-lodges. Dominica has become a hot spot for the adventurous travelers who stay in charming but authentic rainforest lodges. On the east side of the island, near Rosalie, check out the 3 River Eco Lodge. This lodge also owns the adjacent Rosalie Forest Lodge which can hook you up with a treehouse, a Creole cooking class, or even a local homestay. Close to popular Trafalgar Falls is Papillote Wilderness Retreat, which offers four hot spring pools and a yard with clucking chickens and preening peacocks. 10 days on a small island can seem like a long time, but once you fall into the chill swing of things you might wish for 10 weeks. For a good introduction to Dominica, you’ll want to have at least 2 days to hang out and explore Roseau. Stay in the city for 5 nights and use the other days for day-trip excursions. After you’ve have your fill of “city” living, work your way up north for 2 nights in Calibishie. If you haven’t made it to Portsmouth yet, now is the time. For your last 3 days, explore the Carib Territory and the eastern side of the island. Take a drive down to La Plaine; this section of road takes you along an impressive section of Atlantic coastline where you’ll feel like you’re in Pirates of the Caribbean. Roseau is tiny by capital city standards, but there’s lots to do. Botanical gardens, zouk music bars, fried chicken, and colorful daily markets are only the beginning. Roseau can also be used as a base camp; from here you can easily take day trips to Champagne Beach, Scott’s Head, Trafalgar Falls, Emerald Pool, Soufrière Springs, Boiling Lake and maybe even try some whale watching. Staying in the capital also allows you to take advantage of a variety of restaurants and bars after a day of exploring; what better way to enjoy a strenuous day’s hike than drinking a fresh Kubuli while watching the sun set over the Caribbean Sea? If you’re in the mood for something more secluded, reserve a few days for a stay in the jungle. Dominica’s various lodges and cabins are ideal for this; you’ll be nestled into your own tropical wonderland, free to explore the surrounding areas. If the beach is calling you, make your way up to the fishing village of Calibishie, which features the only sand beach on the island. Here you can spend a few days lounging around and taking part in the local fishing life, complete with seafood dinner with a view. Take time to plan for some of the top excursions that are Dominican favorites: Boiling Lake, Scott’s Head which is known for some excellent diving and snorkeling, the Carib Territory – home to the indigenous population of Dominica – and finally, the northern city of Portsmouth and Fort Shirley. 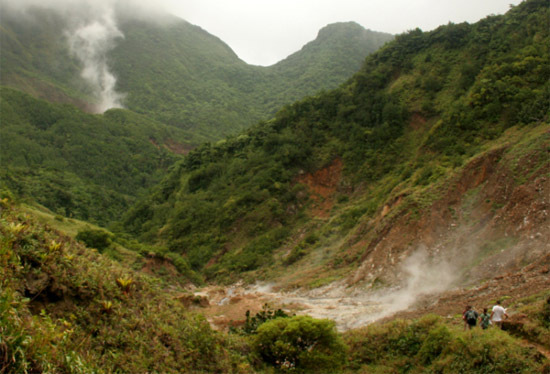 Maybe the most romantic aspect of Dominica is the plethora of waterfalls and hot springs. Known as the “nature island” Dominica offers a pristine Caribbean wilderness. In fact, Dominica is the only island in the Lesser Antilles with a UNESCO World Heritage Site. Most of Dominica’s environmental attractions are in Mornes Trois Pitons National Park and therefore require an eco-tourism site pass. Single site passes can be purchased for $5 XCD, usually close to the site. Unlimited week passes are $26 XCD. From Roseau you can reach most of the major waterfalls and outdoor attractions, although some take longer hikes to get to than others. Trafalgar is the closest to the capital and therefore the most crowded; go in the morning to avoid the mid-day crowds that flock in from harbored cruise ships. For a more secluded hike, put Middleham Falls on your list. The most popular trail access is from Laudat and consists of a winding jungle path that takes you through the depths of the Caribbean flora and fauna before arriving at the impressive Middleham Falls. Because of the longer hike to get to the falls, Middleham is less frequented. Pick up a few baguettes, fresh fruit and a loaf of homemade banana bread at one of the local stores before hitting the trail. On the east side of the island you will find hikes to both Sari Sari and Victoria Falls; both are classified as medium to difficult, but well worth the effort. Keep in mind that the trails can often be slippery and tiring; you’ll need sturdy shoes and some sustenance. Beyond waterfalls, Dominica is one of the youngest islands in the Lesser Antilles, meaning that its volcano base is constantly changing the landscape. Active volcanoes mean a wealth of natural hot and sulfur springs scattered around the island. One of the island’s favorite natural hot springs is Screw Spas in Wotten Waven – just up the valley from Roseau – run by a quirky man with dreads and a constant smile. For more luxurious spa destinations check out Rainforest Paradise, Jungle Bay Resort and Spa and Rainforest Shangri-La Resort which offer luxurious specialties like aromatherapy massages, mud scrubs and yoga. Also check out these luxury Caribbean holidays. With all the physical activity that your Dominican adventure will entail, there’s no question you will build up an appetite. The staple Dominican diet consists of a hearty amount of chicken, rice, plantain and manioc root. Roseau offers a variety of restaurants from traditional Caribbean to Chinese. Fresh fruit is served as is or pressed into juices, and you can’t come away from Dominica without a new addiction to passion fruit juice. For a quick bite, many roadside “snackettes” offer a selection of meat pies and sandwiches; the best ones made with a codfish. These are often the best places to get the low-down on local life. Stop in, buy a sandwich and a local Kubuli beer and prepare for a story. Mini-van ‘buses’ run often and are dependable. If you want to explore independently at a slow pace, renting a car is a good way to go. Remember that Dominicans drive on the left side of the road. Dominican law requires a Dominican driver’s license, which costs $12 XCD. Pick one up at the car rental agencies. Keep in mind that 4 wheel drive vehicles are helpful but not necessary, but beware of the many potholes which cover the roadways, and you’ll be driving on the left hand side of the road! Once you start doing some research, you will find that many Dominican websites look like they were made in the early 90s; don’t hold it against them, the information they contain is up to date and helpful. Good places to start are A Virtual Dominica, Discover Dominica and Visit Dominica. You can also check out Dominica: The Nature Island of the Caribbean an online book which I designed and wrote last spring. Having hitchhiked across the Caribbean, Matador traveler anthonygatti knows his stuff about a lot of the islands. Deva has spent the last month in Saint Vincent and the Grenadines, giving a good insider perspective to Caribbean travel that doesn’t include cruise ships.